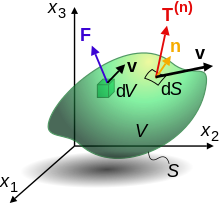 Example: A model airplane of mass 1 kg accelerates from rest to a velocity of 6 m/s due north in 2 s. The net force required to produce this acceleration is 3 newtons due north. The change in momentum is 6 kg⋅m/s due north. The rate of change of momentum is 3 (kg⋅m/s)/s due north which is numerically equivalent to 3 newtons.